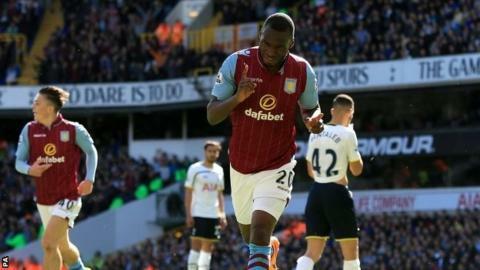 In-form Christian Benteke scored the only goal as Aston Villa beat Tottenham to move six points above the relegation zone. Benteke headed in Leandro Bacuna's cross as Villa boss Tim Sherwood got the better of his former club. Villa deserved their victory and almost had a second when Gabby Agbonlahor hit the post from Benteke's flick-on. Tottenham striker Harry Kane struggled to get into the game, as did most of his team-mates. If Sherwood keeps Villa up, he will owe much of it to Benteke, who is the top scorer in the Premier League since the manager's appointment. The Belgian has scored eight in his last six Premier League matches, having scored two in the 16 before his arrival. As well as moving closer to Premier League safety, it will be doubly sweet for Sherwood against the club who sacked him as manager in May. Sherwood gave Kane his first top-flight start last season and claimed last month he stopped the club selling the striker. Kane, alongside Benteke, is one of the in-form strikers in England - having scored 11 in his previous nine league appearances. And he perhaps repaid his old manager with a quiet performance at White Hart Lane. Kane was aiming to score the goal that would make him the first Tottenham striker to reach 30 in a season since Gary Lineker in 1991-92. He had a few half chances but failed with a 30-yard snapshot in the first half, and a curling effort over the crossbar after the break. His frustrations in front of goal were echoed by team-mate Christian Eriksen, who has now not scored in 12 games having netted 11 in the first 30 of the season. The signs were ominous for Villa when they lost defender Ciaran Clark to injury in the first half, and Bacuna looked like he was going to have to go off with a knock of his own. But the Dutch full-back played on and had a role in the game's deciding moment, whipping in a cross as Benteke beat defender Federico Fazio to head home off the post. Agbonlahor almost wrapped up the win just before the break when he hit the post from the edge of the box after Benteke flicked a header onto him. Spurs brought on £60m pair Erik Lamela and Roberto Soldado but Villa defended well and Fabian Delph almost scored a second late on with Michel Vorm having to deny the midfielder. Sanchez made things more difficult for his side at the end when he was shown a second yellow card for a late tackle on Danny Rose, but they held on. Aston Villa boss Tim Sherwood: "It's a fantastic result - we carried on from the good performance in the 3-3 draw against QPR. We thought we could have a good go and we did. I thought we deserved to win. "Tottenham chairman Daniel Levy made the decision [to sack me] based on what he thought was the right thing to do. Mauricio Pochettino is doing a good job. Without Spurs giving me the job last year, I wouldn't have been here today to enoy this win. "We've got some tough games. No-one gave us a chance here or at Manchester City in the next league game. We're within touching distance. On the downside we picked up a few injuries. "It's a fantastic result for me and Aston Villa." Tottenham boss Mauricio Pochettino: "We had some chances, we had possession and managed the game. But they scored their first chance. It was a tough game. I'm disappointed for the players and with the result. "It was difficult to come back into the game. We needed to be more clinical. But it wasn't enough to score today. "I think maybe after we analyse the game, we'll see we deserved more. But this is football." BBC MOTD commentator Jonathan Pearce: "Tim Sherwood returns to White Hart Lane where Tottenham dumped him as manager and he wins. It's a huge win for Aston Villa. Christian Benteke's rich vein of form continues - his goals could steer Villa to safety and maybe an FA Cup final. Sherwood has turned Villa's season around but Tottenham's season is in danger of petering out." Match ends, Tottenham Hotspur 0, Aston Villa 1. Second Half ends, Tottenham Hotspur 0, Aston Villa 1. Attempt blocked. Federico Fazio (Tottenham Hotspur) header from the centre of the box is blocked. Assisted by Danny Rose. Second yellow card to Carlos Sánchez (Aston Villa) for a bad foul. Delay in match Fabian Delph (Aston Villa) because of an injury. Fabian Delph (Aston Villa) wins a free kick in the defensive half. Offside, Tottenham Hotspur. Harry Kane tries a through ball, but Roberto Soldado is caught offside. Corner, Aston Villa. Conceded by Christian Eriksen. Joe Cole (Aston Villa) wins a free kick in the attacking half. Corner, Aston Villa. Conceded by Michel Vorm. Attempt saved. Fabian Delph (Aston Villa) right footed shot from the centre of the box is saved in the centre of the goal. Assisted by Christian Benteke. Attempt saved. Andreas Weimann (Aston Villa) right footed shot from the right side of the box is saved in the bottom right corner. Assisted by Tom Cleverley. Attempt missed. Ron Vlaar (Aston Villa) header from the right side of the six yard box is close, but misses to the right. Assisted by Joe Cole with a cross following a corner. Corner, Aston Villa. Conceded by DeAndre Yedlin. Andreas Weimann (Aston Villa) wins a free kick on the right wing. Christian Benteke (Aston Villa) is shown the yellow card. Offside, Aston Villa. Leandro Bacuna tries a through ball, but Christian Benteke is caught offside. Substitution, Tottenham Hotspur. DeAndre Yedlin replaces Vlad Chiriches. Substitution, Tottenham Hotspur. Erik Lamela replaces Andros Townsend. Offside, Tottenham Hotspur. Christian Eriksen tries a through ball, but Harry Kane is caught offside. Attempt missed. Harry Kane (Tottenham Hotspur) right footed shot from the right side of the box is high and wide to the right.